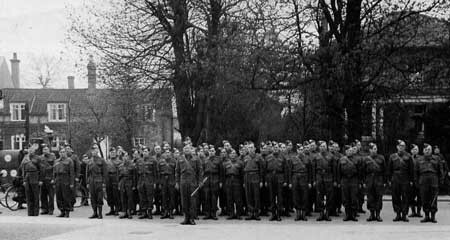 Bishopthorpe Home Guard on parade in Main Street. Seventy years ago, on 3rd September 1939, Prime Minister Neville Chamberlain broadcast to the nation. It was a momentous yet typically downbeat statement that, apparently, most of the British nation listened to, having been alerted that it would contain the news that it did. To commemorate this historic anniversary, villagers’ reminiscences and photographs showing how they buckled down to life on the Home Front, can be seen in Bishopthorpe Library. The Local History Group delved into the Bishopthorpe Community Archive for photographs and memories from recorded interviews. Many of them reveal the indefatigable spirit and sense of humour which carried the villagers through six years of war. In Bishopthorpe, like everywhere else, men, women and children on the Home Front adapted to a different way of life; they put up with shortages; saved for the war effort; “dug for victory”; “got on with everything” and “did their bit”. They joined organisations such as the Home Guard, the Civil Defence and the National Fire Service; they raised money for Spitfires and Hurricanes; they knitted much-needed socks for seamen. 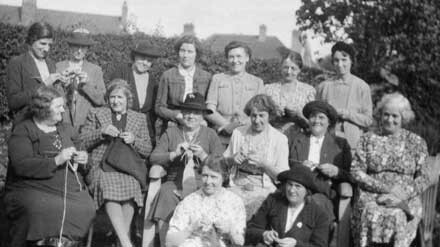 Bishopthorpe Womens’ Institute knitting socks for seamen using special ‘oily’ wool. If you would like to see more, then visit Bishopthorpe Library where our display will be on show until 4 September. Thank you Linda for your most interesting articles. Carol Woollcombe was my Sunday School teacher over fifty years ago. I well remember her class and playing with plasticine and sitting in small round backed wooden chairs in the vestry on Sunday mornings.